Established in 1880 and counting more than 130,000 members, the American Society of Mechanical Engineers (ASME) is one of the world’s most important institutions in the field of engineering. 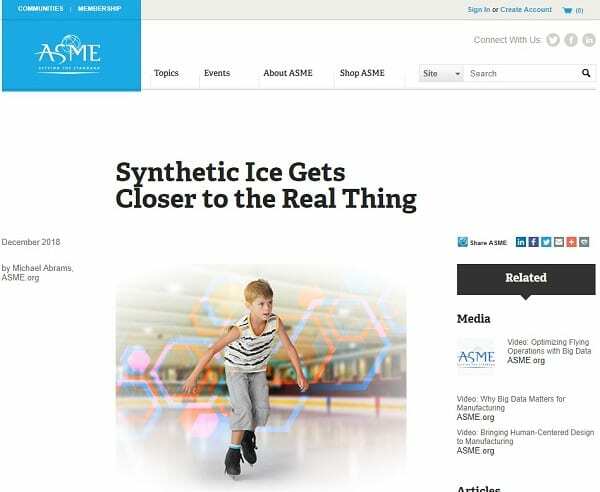 It is therefore a great honor for Glice® to be featured in an article about the improvements of synthetic ice. Hockey players, figure skaters, and terrified beginners hugging the wall as they go round-and-round know the troubles that come with skating on ice. For one thing, it’s cold. If you want to do it outdoors, you’re restricted to very cold weather. For skating rink operators, there’s the issue of energy costs. Keeping water in its solid state amounts to the largest bill for rink owners, and while a Zamboni at work is a pleasure to behold, ice doesn’t stay slick without it. All these downsides evaporate when ice is replaced with plastic. The first plastic synthetic rinks, which hit the skate scene in the 1970s, were somewhat better than skating on concrete. But they had to be coated with lubricants to be slippery and gave off a lot of shavings as skate blades cut across them. Now, using more advanced materials and techniques, companies like Glice are making synthetic ice that is more like the real stuff than ever before. Glice co-founder Toni Vera, a hockey player and engineer, skated on an early version of synthetic ice in Canada, years ago. 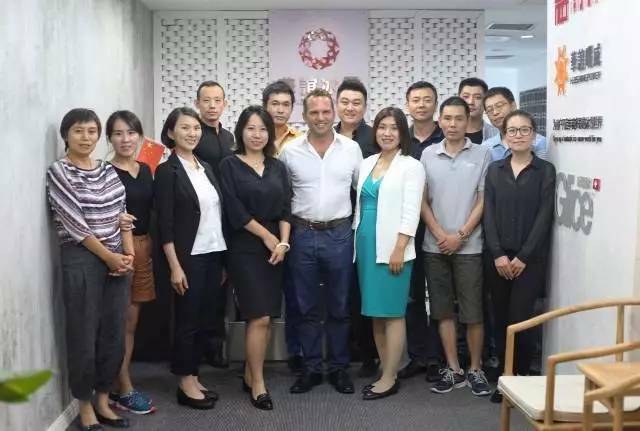 “He came back from that trip and he couldn’t get it off his mind,” said Viktor Meier, the company’s CEO and co-founder. In fact, it stayed on his mind for eight years. During that time, Vera experimented with self-lubricating polymers, to find the right ingredients to best approximate real ice. On traditional rinks, skates melt the ice as they slide over it, essentially creating a thin track of water. With Glice, skates release lubricants in the polymer instead. The exact formula remains proprietary, but the polymers that make up Glice, which fall between high and ultra-high density, are made with silicone and other additives. To best reproduce the experience of skating on the real thing, Glice engineers had to do more than just aim for ice’s coefficient of friction. Instead, they repeatedly had skaters test out different versions. Vera and Meier also abandoned the injection molding used by other plastic ice producers and switched to pressing. A long press time with high heat creates a higher density, which reduces shavings. It also means that, aside from micro-scratches, the surface stays smooth for the duration of its 13 to 15 years’ of life. “After that you can flip it over and have a brand new rink,” said Meier. Professional hockey players and figure skaters attest to Glice’s closeness to the real thing. Real ice may arguably remain king, but only when it’s at its freshest state, especially right after a Zamboni passes over it. But the company is still in competition with real ice, and they hope to eventually match the performance of ice at its cleanest and freshest. They are also working on making their product self-healing and dirt ejecting. In the six years of its existence, Glice has delivered “ice” to more than 80 countries. Now outdoor skating is available in balmy climates like Israel, Peru, Iran, and Dubai, among many others.